So we have had a pretty wet hot and wet summer this year. 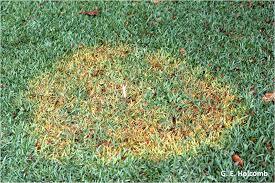 Because of these conditions Brown Patch, a fungus, could be an issue in your yard this Fall. We will address it when we come out but if you see it sooner and would like us to come out earlier please just call the office. Also, here are a couple recommendations to help maintain a beautiful, healthy yard. Watering the lawn twice a week for right now is recommended until we start to get consistently cooler weather which may not happen until after we put our clocks back. You should also be cutting the grass weekly until then as well. Make sure to double check your irrigation coverage and always cut with a sharp blade. Once we do get the cooler weather and time change you can water once a week and cut every other week. If you have active Brown Patch in the yard it is best not to cut until its treated because the mower can spread the disease throughout the lawn. Please feel free to call the office or talk to your technician. We want to have the best looking yard going into the Holidays.